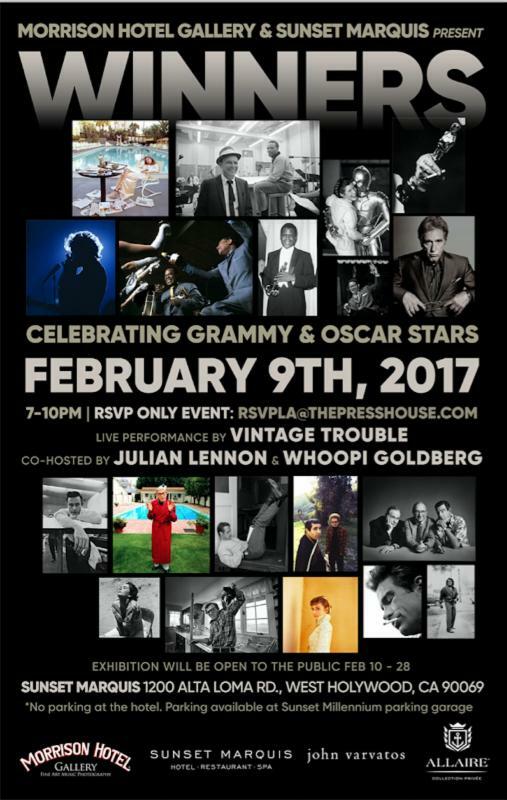 Last night, (Thursday, February 9th) the Morrison Hotel Gallery and the Sunset Marquis Hotel hosted “Winners,” a collective exhibition celebrating all the artists who have been nominated or have won a coveted Grammy and/or Oscar. This unique exhibition showcased the rich history of these two awards and all of the artists that have been nominated and won a Grammy or an Oscar, or both. 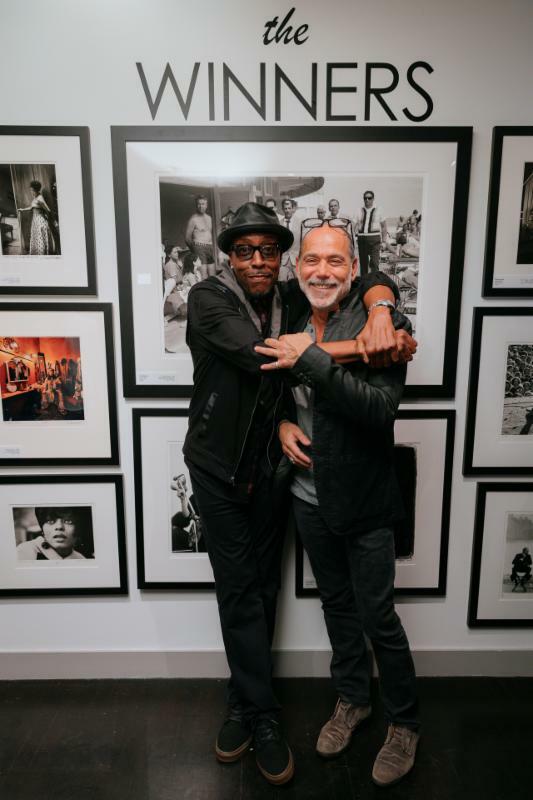 The evening was co-hosted by musician artist and photographer Julian Lennon, Academy Award winner Whoopi Goldberg and gallery co-owner, photographer and the hotel’s cultural curator Timothy White. “Winners”was sponsored by Morrison Hotel Gallery, the Sunset Marquis Hotel, John Varvatos and Allaire Collection Tequila, Vodka and Rum. Poolside, under the stars, Vintage Trouble played their guitar-powered rhythm & blues. 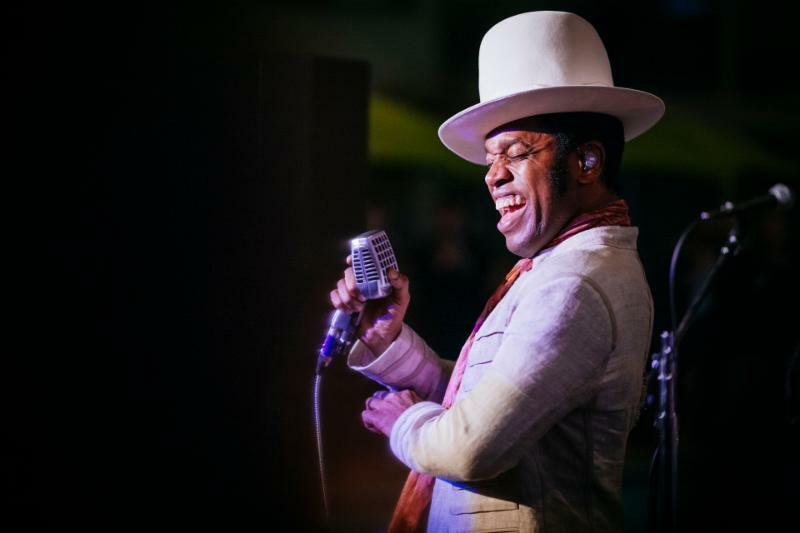 On a 30-foot screen guests can watch a video compilation of performances, appearances, speeches and some rare footage of moments from the Grammys and Oscars. Cocktails and Hor d’oeuvres will be served, including a signature drink by Allaire. 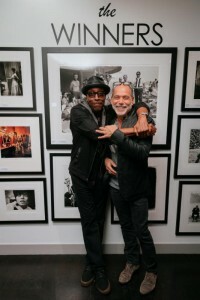 In the gallery, the exhibition featured images of Grammy winners like Ella Fitzgerald, Frank Sinatra, Joni Mitchell and Van Halen, and past Academy Award winners Marlon Brando, Audrey Hepburn, Jamie Foxx, Woody Allen and Heath Ledger taken by such legendary photographers as Herman Leonard, Henry Diltz, Barry Feinstein, Milton Greene, Danny Clinch and Timothy White among others represented by the gallery. The exhibit will be open to the public from February 9th thru February 28th. 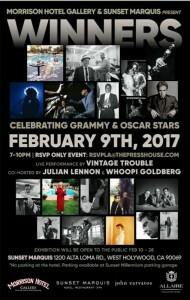 Both the Grammys and the Oscars are celebrated in Los Angeles in February and the Sunset Marquis will be brimming with famous faces – winners, presenters and nominees for both award shows. Winners exhibit, please visit www.morrisonhotelgallery.com. An Interview With the Arizona Rockers DED On Their Latest Album and More! An Interview With The Tel Aviv Based Foursome, LESS ACROBATS!